Allan Zeman, who turned around Hong Kong’s Ocean Park theme park and gave Disneyland a run for its money, is consulting on the future of Cleland Wildlife Park, a tired attraction in the Adelaide Hills, as a prelude to possibly investing in it. Developer Mr Zeman, also known as Hong Kong’s “Father of Lan Kwai Fong”, for bringing life to the former British colony’s now famous nightlife district and who owns entertainment precincts in mainland China and a stake with DreamWorks Animation in Shanghai Dream Centre, said a facility such as the state-owned Cleland was well placed to tap China’s growing tourist market as outbound travellers rose from the current 130 million to 200 million by 2020. The 50-year-old theme park, which gives visitors up-close encounters with animals including kangaroos, koalas and wombats in a bushland setting, could benefit from the expertise of Mr Zeman, nicknamed “Hong Kong’s Mouse Killer” for the way he turned around Ocean Park and boosted it to record ticket sales even as Walt Disney reported a fall in attendances at Hong Kong Disneyland. 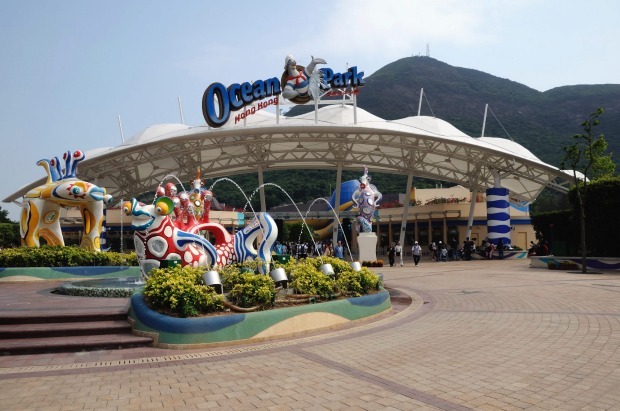 Main entrance of Ocean Park Hong Kong. But it’s not just a regional Australian story. Cleland is in a similar position as much of Australia’s other tourism and visitor infrastructure – it desperately needs private investment to stay relevant. In Sydney, the $3.7 billion worth of development expected at Circular Quay over the next eight years is being funded by private money, some of it offshore. Mr Zeman, who counts businessmen Solomon Lew and Lindsay Fox among his friends, has no investments to date in this country, but said soaring prices in Hong Kong and in many Chinese cities had made land unrealistic and it was prompting developers to look further afield, principally to south-east Asia, but also into Australia. South Australian Environment and Conservation Minister Ian Hunter confirmed the involvement. “We are interested in the idea of redeveloping Cleland Wildlife Park into a larger precinct with more activities and adventures, and have talked with Allan about how to make this work,” Mr Hunter said. The relationship, which began with an offer by state Governor Hieu Van Le in 2011 to give Hong Kong koalas led to the opening of an SA-themed exhibit at Ocean Park in 2015. SA Premier Jay Weatherill last met Mr Zeman in Shanghai in May, at the time of the Port Adelaide-Gold Coast Suns AFL game. The relationship has already benefited the central state. Mr Zeman said he had helped SA get a direct flight to Adelaide from Guangzhou by China Southern airlines. Cleland, a 20-minute drive from the Adelaide CBD, had the same opportunity as Ocean Park, of which he became chairman in 2003.